Steven Taylor (foreground) celebrates a Posh goal at Aston Villa in this season's FA Cup. 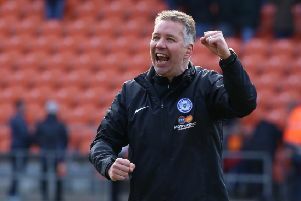 The only Posh player with Premier League experience won’t rule out an FA Cup upset at the ABAX Stadium on Saturday (January 27). In-form centre-back Steven Taylor made over 250 appearances for Newcastle United and has more of an insight than most about the top flight approach to cup ties. Steven Taylor celebrates after the Boxing Day win at Bradford City. Taylor was at Newcastle, but didn’t play, when the Magpies were knocked out of the FA Cup by League Two Stevenage, a team managed by Graham Westley and inspired by goalscoring midfielder Michael Bostwick, in 2011. “There have been so many upsets down the years and now we have the chance to do it,” Taylor said. “And it’s a good chance. Anything can happen. We have to make sure we concentrate, but we have the ability to beat Leicester. “We demonstrated that against Aston Villa in the last round. “Obviously Leicester are a really strong side. They won the Premier League not so long ago after all. “They have a lot of international players, a lot of quality, but on the day it doesn’t matter about that.